Windows 10 has some hidden files and folders you can view if you know to find your ways around the OS. This hidden files can be accessed through the Windows Explorer, control panel, and using CMD. Both Windows Explorer and control panels unhidden hidden files and folders while the use of CMD unhidden folder and files that are hidden by virus. Here in this article today I will share with you how to view hidden files in Windows 10 with three different approaches. To unhide files and folder in Windows 10 with the help of Explorer. Right-click on the “Start” button and click on “File Explorer” from the taskbar. Click on View >> Option >> Change folder and search options. Click on “View” and scroll to “Advanced settings” and tick “Show hidden files, folders, and drive and then click on “OK” to unhide hidden folders and files. With this approach, all hidden files and folders will be unhidden and you will be able to view them. Meanwhile, this is just one of the three ways to show hidden files and folder in Windows 7, 8, and Windows 10. There is another way to show hidden files and folder on Windows OS. The next easiest approach to do this is through the control panel in your Windows 10. 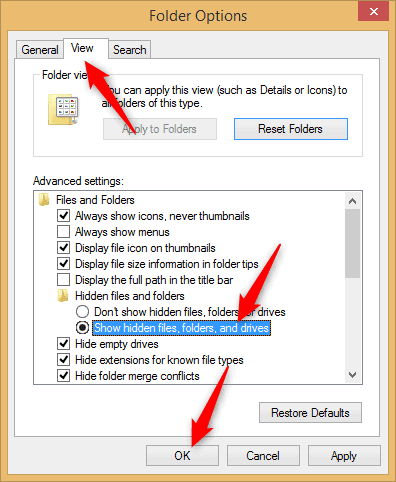 Below is a step by step procedure to show hidden folders and files in Windows 7, 8, and Windows 10 respectively. Right-click on the “Start” button and click on “Control Panel. Click on “Appearance and Personalization and then on File Explorer Options (Show hidden files and folders in Windows 8). Click on “View” and move your eyes to “Advanced settings” to tick ” show hidden files, folders, and drive and then click “OK”. This is unarguably a suitable approach to see all hidden files and folder in Windows 7, 8, and Windows 10 through the control panel. Do not use this method if you do not know what you are doing. Windows registry OS should not be tampered with for any reason. However, the same registry can be used to unhide hidden files and folder in a few steps. Press and hold “Windows button + R” or right-click on the “Start” button and click on “Run” then Type “regedit” and press the “Enter” button and click “Yes” to access your computer registry. Click on “HKEY_CURRENT_USER >> Software >> Microsoft >> Windows >> CurrentVersion >> Explorer >>Advanced. Right-click on “Hidden” then “Modify” and type “1″ in “Value Data” column or double-tap on “Hidden”. The “2” number instruct the Windows program not to show hidden files and folder. Navigate to “ShowSuperHidden” double-click on it and set the “Data Value” to “1” to show all protected files on your operating system while “Data Value “2” does otherwise. You can also use CMD prompt to view all hidden files and folder in Windows 10. The only issue with view hidden files and folders using CMD is that the command line also unhidden files and folders that are hidden by viruses on your computer. WikiHow has a complete guide on how to remove computer virus using CMD.